I'll start off with another small detail shot of some of the crewel embroidery stitches I'll be teaching at the Crewel Embroidery Retreat here at the farm this summer. 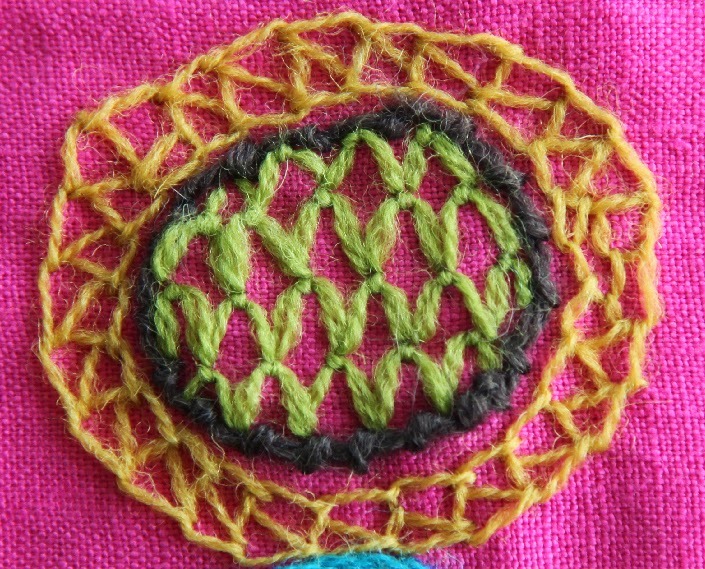 We'll be learning 18 new stitches which are not included in the Craftsy on-line video which I teach. 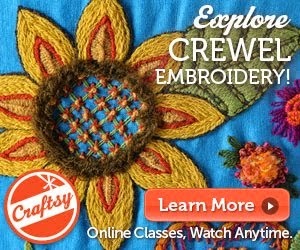 BTW, Craftsy is having a fantastic "summer holiday" sale on ALL their classes beginning today. Here is the link to enjoy HALF OFF. Sale runs through midnight June 9th. 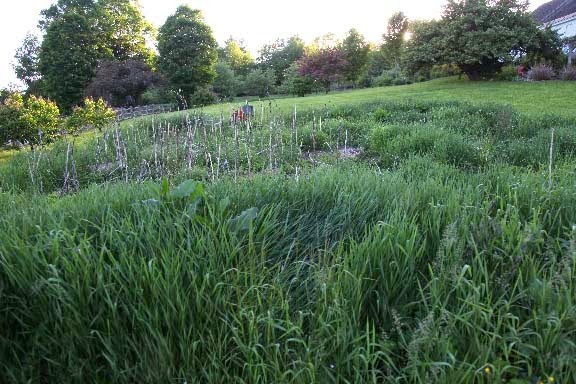 Click here to find out about the summer retreats at the farm. ....... until yesterday. It was tilled and now the rush is on to get it all planted before the weeds come up again. I am headed to Walker Farm today to do my annual shop of their fabulous seedlings. I have posted about Walker Farm here and it never disappoints. I love the look of the fresh plowed earth and all the anticipation of what is to come in the next couple warm months. I've found a new garden shoe that I like quite a bit. They are called Sloggers and come in 3 heights. I have the low style right now but want to add the two other heights because I am frequently walking around in high grasses. You can check them out here. American made too. They are quite comfy and come in fun colors and prints. Julia has terrible problems getting shoes to fit because she wears orthotics. We got her a pink print pair (her signature color) and she loves them. There are only two weeks left for Julia of school this year. I can feel my rush to get stuff done before she is around every day. Although she is older and more independent, she still craves my attention and wants to be entertained some. We don't generally go away on a family vacation - it is too hard to leave the animals alone. It has been years and years since I have traveled anywhere besides a free vacation at my family's or for a work destination. It's okay, really, but once in a while I dream of going to London again. This is happening in the Spitalfields area on June 7th. What a fun day in secret backyard gardens this would be. Or maybe a visit to The American Museum in Bath where Kaffe Fassett has a new exhibition. Check out the video here about the installation and design of the exhibition. It looks more than FABULOUS. On until November. 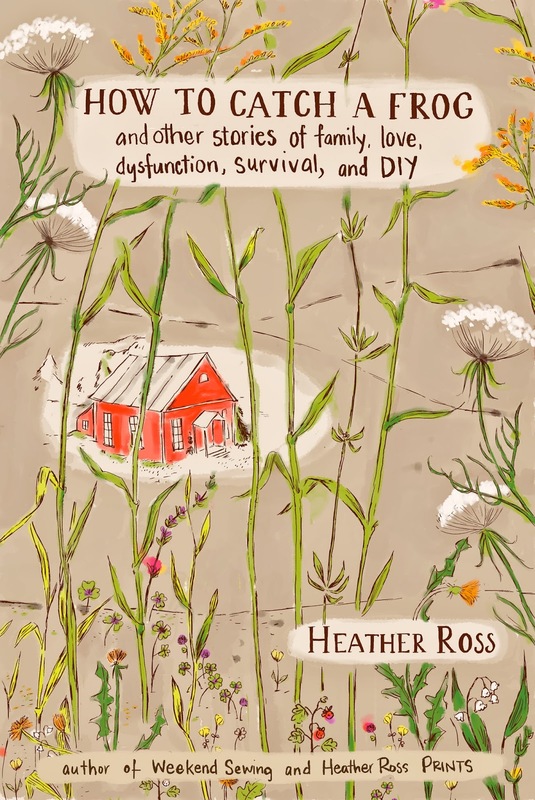 I just finished reading Heather Ross's memoir How to Catch a Frog and other stories of family, love, dysfunction, survival, and DIY. Let me start this off by saying that I do not know Heather. 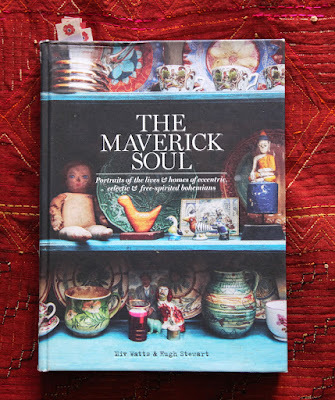 I have followed her work in the textile field on and off through her blog. Heather is an incredibly talented illustrator, fabric designer and teacher. This is her third book - the others are Heather Ross Prints 2012 (includes a DVD for downloading prints, many cool craft and sewing projects, and a good introduction to how to create repeating designs in Photoshop for all of you who want to design your own fabric). Her first book was Weekend Sewing: More Than 40 Projects and Ideas for Inspired Stitching (2009). She also illustrated the kids book Crafty Chloe kids series. What a talent. Heather had an unconventional childhood in northern Vermont. The book is mostly words but is also illustrated with her incredibly sweet paintings and includes some how-to project ideas. How to Catch a Frog and other stories of family, love, dysfunction, survival and DIY is mostly stories about her childhood. Heather is a great storyteller in words - as she is in her illustrations. Her fabrics look like little stories of childhood on a piece of fabric - a childhood many people dream of in the country. Heather does not hide the fact that growing up in a rural area is not exactly what city dwellers think it is. Let me just say that and you'll have to find out more by reading. Heather runs Creative Retreats (including one in northern Vermont each summer). I have friends who have gone and had a fantastic time. You can check out her workshops here including an upcoming one on designing your own fabric in NYC in November. There is a rather in-depth review of How to Catch a Frog on Quilty Pleasures here. And yes, you will learn how Heather catches a frog - I have always been a bit squeamish around amphibians so I was interested to read the technique. This book would be a great summer read and it is also available digitally for those who prefer reading on a device. What is your favorite biography/memoir/ or just plain old book you loved and want to re-read this summer? Contest ends Sunday, June 8th at 11:59 p.m. As always, please leave an easy way to get a hold of you - Rav id, blogger id or email. US addresses only. I loved the Tove Jansson biography "Life, Art, Words" by Boel Westin. But this summer I'm re-reading "Jane Eyre". Would love to read "How to Catch a Frog", too! I am re-reading William Faulkner's "Light in August". I probably read it once per decade and it is as relevant now as ever. It is a lovely and magical book and the prose is simply gorgeous. Good morning...I am planning on a summer of returning to my favorites and recalling moments of time from years ago. I remember reading A Secret Garden as a child and being engulfed in the story- a favorite book I have shared with my daughter and on my list for a summer re-read. any of Elizabeth Zimmerman's books....I turn to them often, and while so many are 'pattern' books, I find myself caught up in all the little family stories and anecdotes she includes. A favorite book of mine is Prodigal Summer by Barbara Kingsolver. Would make for great re-reading this summer!!! Thanks! I was always a girl who loved fiction, until a friend of mine handed me "Don't Let's Go to the Dogs Tonight" by Alexandra Fuller. Remarkable memoir about her childhood growing up in Africa. Another favorite for those of us who romanticize rural life--"The Dirty Life" by Kristin Kimball, who decided to leave her glamorous existence as a travel writer living in NYC to follow the big, scruffy man she fell for and help him transform a neglected property in upstate New York into a thriving organic farm. Awesome. Oh, Kristin, Heather's book sounds lovely! This summer I am planning to reread "The Divine Secrets of the Ya Ya Sisterhood". Thank you! First, thank you for having all of these giveaway opportunities on your site. I've never won anything, but that's no nevermind. I just love that you do it. The memoir that has stuck with me every since high school is Susanna Kaysen's "Girl, Interrupted". It spoke to my teen girl angst and also to fears of mental disturbance, which were later realized when I was diagnosed bipolar. It was deeply personal for me and I read it way before the movie ever came out. In my adulthood, "The Glass Castle" by Jeannette Walls sticks out. It is about a dysfunctional, creative, resourceful (if crazy) family that came into my own Appalachian mountains at one point in their adventures. It is sad and uplifting at the same time. Oops! I just wrote that last post (about the books Girl, Interrupted and Glass Castle) and forgot to add my name and contact! Every summer I reread a book I used to read to my class when I taught. Animal Family by Randall Jarrel. Lovely family tale! I really like Jenna Woginrich's books. I'd love to re-read Made From Scratch and Barnhart. 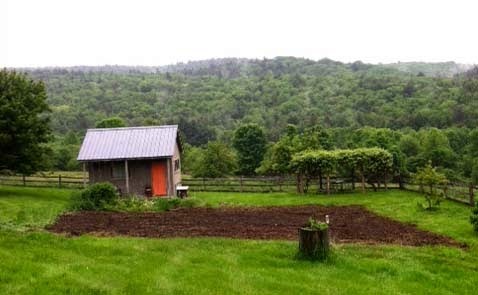 I just bought One-Woman Farm and I know she has another that just came out or is about to. I also love Elizabeth Zimmermann books as Steph said. How to Catch a Frog sounds interesting! I plan on re-reading Memoirs of a Geisha. Favorite biography---- that's such a hard one! I Know Why the Caged Bird Sings bubbles up to the top right now, but I loved Unbroken, Diary of a Young Girl, The Hiding Place. Apparently I enjoy 'dark' bios'! ;) Thanks for the opportunity Kristin, I look forward to watch your garden grow! I love 'Colleen Dewhurst Her Autobiography'. It's a refreshing look at the life of a great actress. I can bear to part with my copy.